Did Nashville school officials protect men who engaged in horrendous sexual harassment against district employees? That's the allegation contained in a new lawsuit that accuses the Metro Nashville Public Schools of running "sham investigations" in response to harassment complaints. Did Nashville school officials protect men who engaged in horrendous sexual harassment against district employees? That's the allegation contained in a new lawsuit. It accuses Metro Nashville Public Schools of running "sham investigations" in response to harassment complaints filed by employees. The lawsuit -- which follows an exclusive NewsChannel 5 investigation -- was filed by three employees at Antioch's John F. Kennedy Middle School against the district, as well as the executive principal there, Dr. Sam Braden. 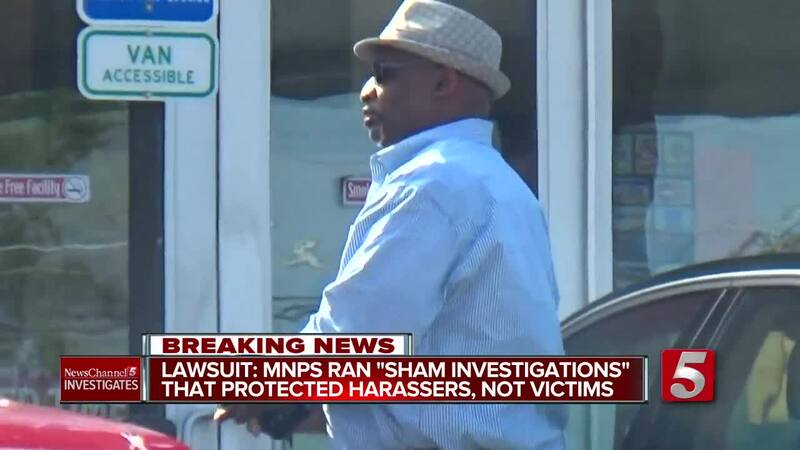 "As an entity, MNPS had a policy and practice of ignoring complaints of sexual harassment, as well as interfering with investigations of harassment," the lawsuit says. "MNPS has engaged in a pattern of practice of protecting Defendant Braden by dismissing complaints against him, despite overwhelming evidence that he has consistently violated the school's anti-harassment policies for many years." The plaintiffs include former football coach Sherman Swindall, along with JFK teachers Sonji Collins and Marcus Kinnon. Braden has previously denied any wrongdoing. Science teacher Sonji Collins also stepped forward with her own allegations. The victims' lawyer, Gary Blackburn, told NewsChannel 5 Investigates, "What's so unusual about this is an on-going pattern of protection of particular people and an overt and obvious pattern of retaliation." Blackburn's lawsuit takes aim at how Metro Schools Director Dr. Shawn Joseph's team handled such cases. In particular, it accuses Sharon Pertiller -- the number two person in the district's Human Resources Department -- of protecting Braden. The lawsuit says that, right after a complaint was filed against Braden in December, another HR employee gave him a letter placing him on administrative leave so the allegations could be thoroughly investigated. "Ms. Pertiller came in, discovered this, became angry, had Dr. Braden summoned back, she took the letter out of his hand and took the employee into the office and tore it up into his face," Blackburn said, describing the allegations in his complaint. The district's own files show Braden had openly bragged about his relationship with Pertiller. And the lawsuit accuses her of having the JFK's principal's back when the HR employee tried to follow the normal protocol and place him on leave. "She told him that she was not going to permit Dr. Braden to be administratively suspended or placed on leave, that he was innocent," Blackburn said. "He replied, 'You don't know the facts.' She says, 'He's innocent.'" Right before that complaint was filed, another Metro Schools administrator, Mo Carrasco, had become the subject of a sexual harassment investigation. Carrasco was a longtime friend of Shawn Joseph and came with him to Nashville in 2016. In Carrasco's case, the lawsuit makes a stunning accusation. "Ms. Pertiller came to the man in charge of this investigation and told him that he better 'get this right' in terms of outcome or Dr. Joseph would fire him," Blackburn said. The lawsuit says that - even though Joseph knew there were allegations against his friend - Pertiller told the HR employee he would not be allowed to interview the director of schools about what he knew. But the lawsuit says that wasn't the end of it. "The outcome was contrary to Mr. Carrasco, and all sorts of retaliation ensued for this employee afterwards," Blackburn explained. As for Braden, the lawsuit also accuses him of harassing employees, then essentially holding them captive when they tried to transfer out of his building. "He made it impossible for them to leave and then when they tried to go to other places we believe that he interfered with their posting at other Metro schools," the attorney added. In Swindall's case, he says he was forced to quit to get away from the harassment. The lawsuit asks for reinstatement to his job, along with back pay. For all three MNPS employees, it also asks for damages and attorney fees -- which means taxpayers could end up paying the price. Metro Schools spokesperson Dawn Rutledge said the district had not been served with the lawsuit "and would not comment on pending litigation." Braden's lawyer, Michie Gibson, insisted his client will ultimately be vindicated. "We look forward to all of the facts coming out at trial," Gibson said. "We are more than confident that once all facts are presented before the trier of fact, Dr. Braden will be exonerated of all allegations."